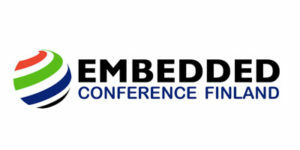 The Embedded Conference is organised in Finland for the very first time. The Embedded Conference is organised in Finland for the very first time. The event will have significant keynotes, panel discussions and two technical tracks; Software and Hardware solutions. The conference is held at the Valopiha (”LightYard”) at Akavatalo in Pasila on May 3, 2017. Data Respons is a silver sponsor at the event. Come talk to us there! Place: Valopiha (”LightYard”) at Akavatalo in Pasila, close to Helsinki Convention Centre.